HOLYOKE—Pop, indie, Ivy League, African—Vampire Weekend's music, identity, and group persona is a kaleidoscope of sometimes contradictory signposts and influences. But therein lies the charm. One of the most talked about bands of the past few years, the Columbia University-spawned quartet rose to prominence with a self-produced debut record that went from an Internet-stoked open secret to a phenomenon: the sort of thing you just had to have an opinion on if you were tuned into the world of innovative popular music. Then the band returned in January with its sophomore effort, Contra, which landed at an unlikely perch atop the Billboard album chart. Still riding the momentum of that success through a rigorous touring schedule shortly to take it to Japan and then Europe, Vampire Weekend plays the new, outdoor Mountain Park venue in Holyoke on Monday, on a bill that also includes Beach House and Dum Dum Girls. The band's sound is literate but exuberant, carefully crafted but laced with spontaneous-sounding energy. Keyboardist and multi-instrumentalist Rostam Batmanglij, who also produces the band's records, points out in a telephone interview that a song like "Horchata," from the second album, manages to be undeniably catchy while avoiding a typical verse/chorus/verse structure. When it's suggested that the song successfully avoids the trap of sounding like a music student’s master's thesis, Batmanglij laughs. "I guess maybe our goal is to make something catchy and accessible and also have a few elements of the master's thesis intact. It's a good trick if you can pull it off," he says. "We worked on that song piece by piece. It actually came together over months and months of adding and taking away, kind of sculpting. "[But] a lot of the things we do are very much instinctual. A lot of what you hear on the record was improvised or a first take, and some of what you hear on the record was revised over and over again until it was just right." Vampire Weekend has managed to be hip enough to spawn not only a backlash but a series of pontifications about the backlash, among the circles of indie tastemakers and trend-followers who analyze the vicissitudes of hype as if it were a perpetually released new album. 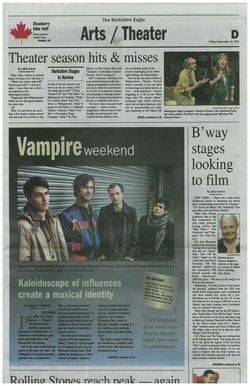 Yet, while it doesn’t sound like anything else on the radio, Vampire Weekend is anything but abstruse. It’s pop. The band members met while undergrads at Columbia, and wrote and recorded their self-titled debut after graduation. They borrowed heavily from various world music traditions, particularly the brand of bright, danceable Soweto township music that Paul Simon previously had alchemized into his hit Graceland album. Yet, as if to diffuse the inevitable complaints about a group of privileged Ivy Leaguers supposedly co-opting other cultures, Vampire Weekend's lyrical focus almost defiantly obsesses over a very particular, narrowly scoped, upper class perspective: a world of Cape Cod weekends, women from Harvard, diplomat’s children and a nonchalantly effusive multiculturalism that reflects the self-consciously, self-congratulatorily liberal perspective presumably found in places like, well, Columbia University. The lyrics are sometimes frustratingly oblique, but laced with a dizzying mishmash of cultural signifiers, at least some of which are prone to send any given listener straight to Wikipedia for elucidation. “Horchata,” a song about a beachside vacation, manages to have verbal fun by rhyming the titular word (a drink popular in Spain, Mexico and Latin America) with balaclava (a form of headgear that that might be worn on the ski slopes), as well as aranciata (an obscure variant on the Italian mineral water S. Pellegrino) and Masada—the grimly monumental historic site of a Jewish mass suicide in the face of a Roman siege. In a deliberate sort of authorial relativism, the proceedings are kept resolutely at face value: if there are value judgments or critiques embedded here about race and class, they are not explicit. Batmanglij, who is of Persian descent and whose parents escaped Iran just before the 1979 revolution, says the band is conscious of the implied socio-political content of its work. In fact, he says it’s impossible to evaluate any band solely on its music, out of social context. "I don't think it's possible to completely divorce music from politics. I think all music, whether it wants to be or not, all music is inherently political in some way. And certainly politics, current events, history—those are all things that we care about and we're interested in. And I think that they influence what we do. I think most people that really listen to our music and care to actually digest the lyrics, most people actually get that." 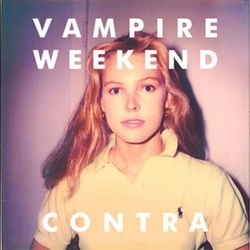 The levels of cultural subtext in any Vampire Weekend song may be dense and tangled. But the end result is some literate, sophisticated pop music that happens to be dance-inducing as well as thought-provoking. And it doesn’t even sound like a master’s thesis.